Journey Blevins of North Union leaps for a layup while a London defender attempts to interrupt her shot. Blevins tallied 14 points during the Lady Cats’ 64-25 loss. With a young team and a young coach, there games that are just going to be a struggle. 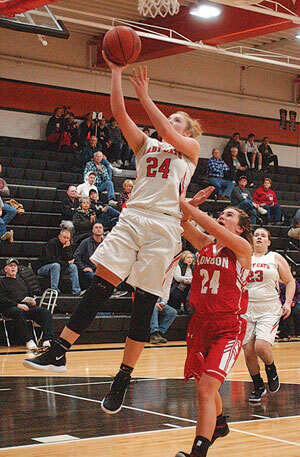 For the Lady Cats of North Union, their Central Buckeye Conference crossover contest against the Lady Red Raiders of London fell into that category as NU fell, 64-25, Wednesday. NU coach Bre Nauman summed up the game very simply. It all started from the tip-off. London set up in man-to-man coverage with a full press. That pressure caused havoc for the Lady Cats as the Red Raiders racked up points and stretched their lead to 12-2 within the first minute of play. North Union was able to figure out an approach to work the ball down the court and start creating offense. Journey Blevins was able to run down court for a long pass on the inbounds and find some buckets. Blevins continued to break out of the tight defense for a total of 10 points in the first quarter. The Red Raiders, though, took a 24-12 lead at the end of the opening stanza. The offensive struggles continued for the Lady Cats in the second quarter as London’s defense continued to apply pressure. Kori Marvin and Madision Amstutz found the smallest of holes to work inside for buckets. NU, however, had no prolonged answer to the Red Raiders’ pressure and trailed, 42-18, by halftime. Nauman said the Lady Cats couldn’t mount any offense. The game continued in the same trend as the first half. The Lady Cats struggled to find the bottom of the net and the Red Raiders continued to push the score. Despite the struggles, Nauman used her whole bench to try and figure out a way around the Raiders’ defense. Despite the one-sided contest, the coach said she sees something special in her team and is excited for the future. The Lady Cats will return to the court on Saturday when they host Benjamin Logan. Trimble 8-2-18, Jones 6-0-12, Mitchell 3-0-7, Coldwell 2-2-6, R. Alexander 2-0-5, Zabloudil 2-0-5, Boggs 2-0-4, K. Alexander 2-0-4, Alderman 1-0-3. Totals 28-4-64. Three-point goals: Mitchell 1, Alderman 1, Zabloudil 1, R. Alexander 1. Blevins 6-2-14, Marvin 2-0-4, Amstutz 1-0-2, Bacon 1-0-2, Deickert 1-0-2, Guy 0-1-1. Totals 11-3-25.